I guess you could think of Cycliq’s Fly6 integrated tail light and HD camera as eyes at the back of your head as you ride your bike. Or an insurance policy that you’ll hopefully never need. Funded through a Kickstarter campaign by Australian cyclists and tinkerers Andrew Hagan and Kingsley Fiegert, the Fly6 is one of those gadgets that you hope you’ll never need to rely on but are rest assured that it’s there just in case something goes wrong. In fact, Fiegert came up with the original idea of the Fly6 after he was hit in the arse by a slingshot projectile while he was out riding his bike. Ouch!! I was lucky enough to win my Fly6 through a Tour de France competition that Cycliq was running during the three-weeks of the cycle event. I’m not usually a winner when it comes to competitions so I was chuffed that I’d won this. 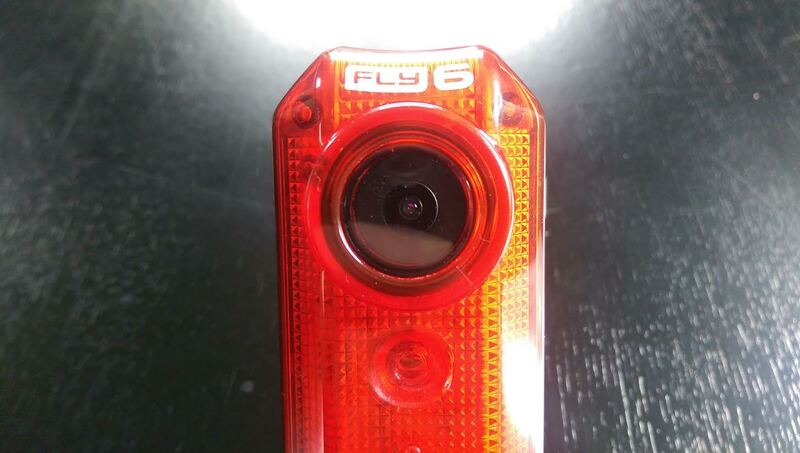 Compared to most rear bicycle tail lights, the Fly6 is bulky, but that’s because this one incorporates an HD camera into the mix [it’s the large round lens underneath the Fly6 logo]. 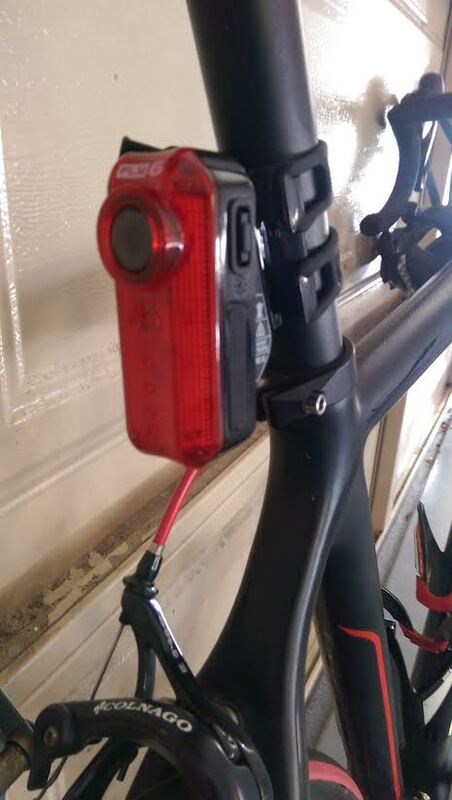 Outputting at up to 30 lumens, the tail light is bright enough to be seen by motorists [it has two flashing modes and one solid mode thanks to the three lights] and the camera records video at 720p [1380 x 720 resolution]. Cycliq says the internal 2600mAh lithium-ion rechargeable battery will give up to six hours recording and lighting time, depending on use. Filming you: The large lens is the HD camera. The flashing strobe unit, which illuminates to indicate that the camera is recording, is visible underneath. The gadget comes with an 8Gb microSD class 10 memory card already installed so everything you need is in the box to get started. The unit is charged via a supplied microUSB cable and will emit a variety of beeps when you turn it on to indicate the battery charge status. Cycliq says if the battery drops under 5% capacity while you’re using it, three long beeps will sound, the audio and video capture function will switch off but the light will continue to work for about 1 1/2 hours. Good to go: The Fly6 fitted to my road bike’s seat post. Fitting the Fly6 to my road bike was incredibly simple: I slid the camera/light unit onto the right sized seat post mount [the box comes with two] then secured it to the seat post using two of the supplied rubber straps. It took maybe a couple of minutes to get it fitted. The box also comes with some spacers to ensure a more snug fit on your bike’s seat post, an SD card adapter and a microUSB cable to attach the unit to your computer to upload captured video, which can then be viewed using program VLC Media Player. I’ve probably had the Fly6 for about three weeks and have used it extensively when I’ve gone for bike rides, generally during the day so I can’t say how bright it is during darkness hours. The video below shows how bright it is. It’s a funny but as a bike rider, you never really think about what is happening behind you when you’re riding your bike, unless you look behind to see whether it’s safe to make a turn or whether there’s room for you to avoid a parked car. If the Fly6 has done one thing, it’s made me more aware of what’s actually happening behind me and shown me just how close vehicles sometimes get to cyclists. I like to think I’m a considerate cyclist: I stay to the inside of the white line as much as practicable and where applicable [sometimes, of course, you have to move across the line for parked cars, road works, potholes in the road] but I’m still amazed at how close some motorists get to me as they drive past. Watching captured video when I get home is generally uneventful – and that’s how I’d like it to stay. That’s why I said at the beginning that the Fly6 is like an insurance policy that you never want to use: It’s there, covering your back, just in case you need it, but for most of the time [hopefully] the footage it captures is uneventful [apart from seeing the odd motorist behind me talking on a mobile phone, which is illegal in this country]. While a rear facing HD camera isn’t a necessity for a cyclist, the Fly6 is a nice thing to have in this age where motorists seem to be a more and more aggressive to cyclists, especially lycra-clad cyclists. The capture quality is good enough to pick out number plates if you need to, and the device records in 10 minute blocks, so if you go for, say, an hour bike ride, you’ll have six recorded segments. I tended to watch through the footage, see whether anything was worth keeping, then delete it from the camera. As I said in the beginning, the Fly6 is a set of eyes watching your back as you cycle and is essentially an insurance policy just in case an incident happens, and you need evidence to back you up – and that’s reassuring. It could be seen by some as pricey for a light, though: With postage, the Fly6 will set you back $214, but for serious cyclists who don’t bat an eyelid at $1000 wheels & bikes that cost thousands of dollars, it’s a small price for peace of mind. *Cycliq is also in the prototype stages of a front-facing camera/light called the Fly12 which will have a 400 lumens front-facing light, a 1080p camera, Wifi capabilities and a smartphone. I’m following its progress with interest. Thanks. 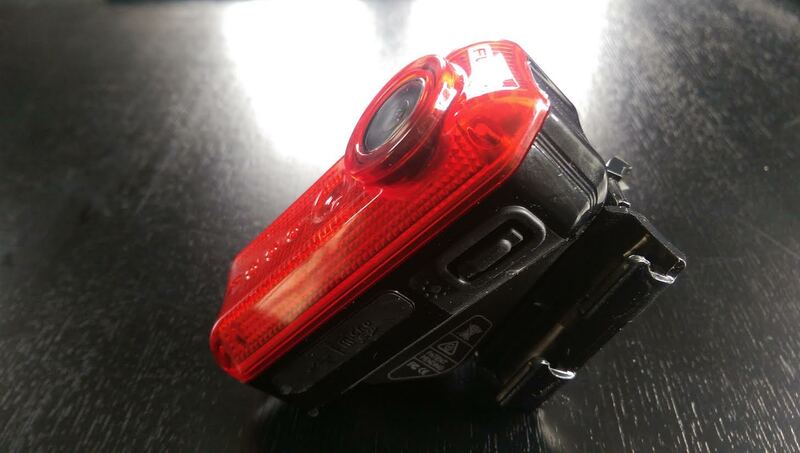 It’s an awesome bike light/camera that I use every day for commuting to work.